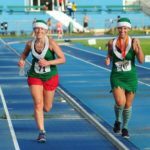 The BVI Athletics Association will appoint a race official who will be assisted by race stewards. decision of the BVIAA is final. finisher medal and other sponsor gifts. ON THE MORNING OF THE RACE. 9.30 a.m. Awards and presentations. of the race and travelled the furthest to participate. registration or collection of bib numbers on the morning of the race. the south gate, DO NOT park at the south gate. Please do not walk on the infield. There are bathroom facilities in the Athletes Building at the track. the road and respect the Highway Code. are unable to attend registration). T-shirts must also be collected at registration. Fair sportsman-like behaviour is expected of all participants. Please keep to the marked route. The roads will remain open. Runners should not take undue risk or run into the oncoming traffic. Entrants run at their own liability. All participants will receive a race medal at the finish line (until the finish is closed). The race results will be sent to all competitors by e-mail and will be published in the local press. signs of injury or excessive strain from the race. 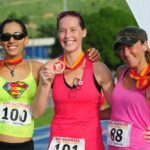 This year marks the 11th anniversary of the BVI Half Marathon, which started in 2006. Adam Wood of the U.S. Virgin Islands won the first race in 1 hour 34 minutes and 40 seconds. another two minutes lowering the record again to 1:15.53. 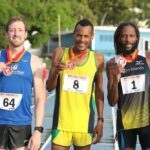 Pamenos Ballentyne won in 1:19 and in 2016 Shane was edged by Grenada’s Kalique St. Jean. knocked a further 25 seconds off her course record. course was introduced in 2008. 2006 Adam Wood, USVI 1.34.40 Rachael McDonald, BVI 1.51.23. 2011 Zebalon McLean 1:34:45 2006 Darwn Peters 1:54.54.